Holy card, Dutch?, 1940s, offered by a nun (probably of the Franciscus Xaverius order of Norway) in March 1949. Black and white, with a small golden edge. 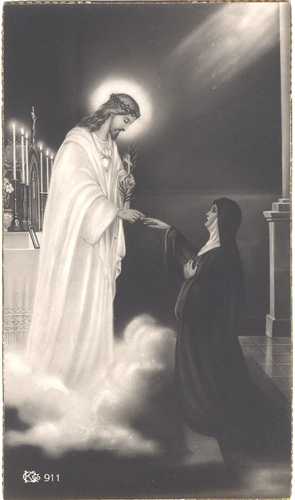 The nun is kneeling before the tabernacle on the altar, and Christ appears on a cloud offering her the ring. In the lower left corner a manufacturers monogram “CKco 911”. On the back is a short handwritten text in Norwegian commemorating the perpetual monastic vows, professed on 19 th March 1949. 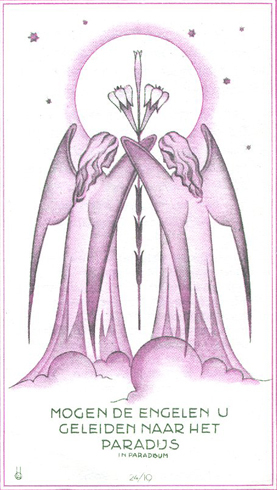 A Dutch funeral card, card of remembrance, ca. 1965, used in January 1967. Offered by a bookshop A. A. Veiner. Monochrome, 105 x 60 mm. Text printed on the back. On the front below the picture the Dutch beginning of “In paradisum” is rendered, the text concluding the Catholic requiem mass. In the lower left corner a monogram, circle with and H (? ), and in the middle “24/19”. 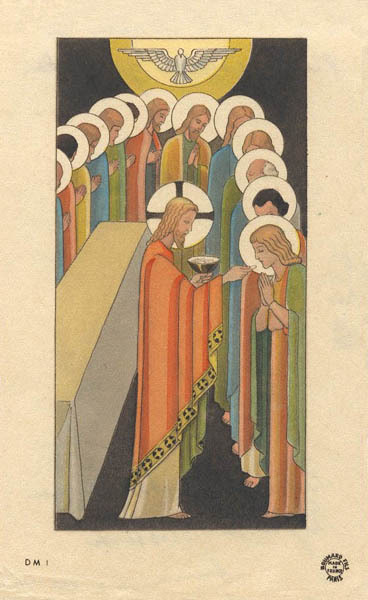 Holy card, polychrome, 115 x 70 mm, printed by Boumard Fils in Paris, France, in the 1930`s. A Belgian Christmas card, probably from the 1950s, polychrome, 110 x 66 mm. 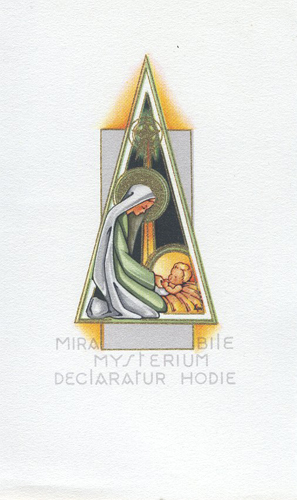 Below the nativity scene a Latin text reads: “Mirabile mysterium declaratur hodie”: today, a wonderful mystery is announced (declared, shown). The back side is empty, at the bottom left corner CBB in a circle, in the middle “printed in Belgium and in the right corner “LW 204”.